5M Reminders for the week of 4/22 - 4/26: There is No School on Friday, April 19th or Monday, April 22nd in observance of Easter. Students should be working on their Living Wax Museum Project daily at home. The May 2nd due date will be here quicker than they think. Permission slips for the Salmon Release went home on Monday, April 15th. Please send them back as soon as possible. We have field trips to Holy Cross Cemetery and Blandford Nature Center coming up in May as well. Spring MAPS Testing begins the week of April 23rd - 26th, and will continue for three weeks. Have a blessed Easter weekend! Grammar: During the past week, students worked with Comparative/Superlative Adjectives, Adverbs, and Writing Titles. Students are required to complete 30 minutes of Grammar IXL homework weekly. This online work is due by midnight on Sunday. They also continued working with D.O.L. each day, helping to further their understanding of the many intricacies found within the English language. Social Studies: Students had a chance to work on their Living Wax Museum Project at school on Thursday (4/18), and should be working on it daily at home. 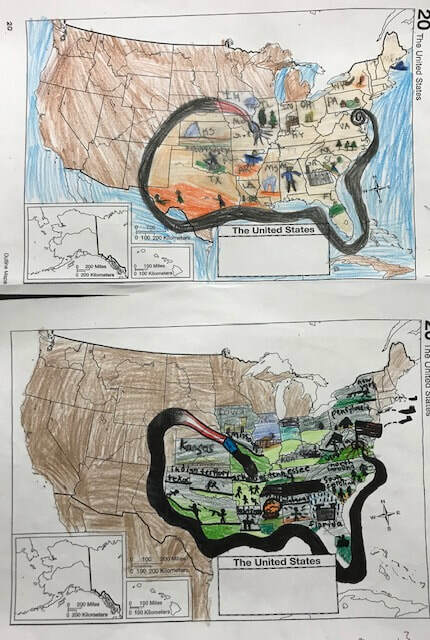 They also worked with Map Skills (Holy Land - Easter version), which was due on Thursday, April 18th. The class read and discussed pages 6 - 23, "American Indian Culture," and answered the questions on page 23. 5M also had their last Junior Achievement class on Wednesday (4/17). Writing: During the past week, students continued working on their Living Wax Museum Project research report. This report will include a minimum of one full page (14 font), along with a cover page and a reference page (minimum of 5 references). This report will be the main writing focus through May 2nd (May 2nd is the due date for ALL Living Wax Museum materials, and it is also the exhibit/presentation day). Math: During the past week, students reviewed what they have learned about decimals and took the short six question assessment on Tuesday (4/16). They also began working with comparing Fractions. Students are required to complete 30 minutes of Math IXL homework weekly. This online work is due by midnight on Sunday.